So obviously, I've been a little busy lately mostly with the volunteer work I've been doing, but also with a few freelance projects. 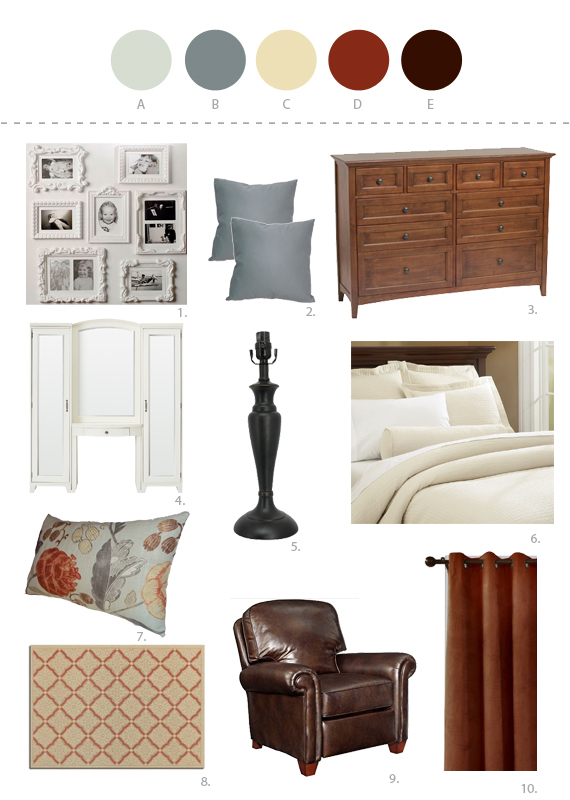 Some friends of mine asked me to help them come up with some plans for their master bedroom/master bath renovation. I've been working on a sketch-up model which I hope to share with you soon, but I wanted to share the first of three design boards. One of the biggest challenges for me in interior design work is setting aside my own personal taste and learning to translate my knowledge of design principles into other design styles. I would describe my own personal style as "modern classic" - a mix of traditional styles, mid-century modern designs, and current trends. For this project, I'm trying my hand at a style that I would describe as "tasteful country" -- clean lined, shaker style furniture with a light, bright, and cozy feeling. A) The Wall Color for the Master Bedroom: Olympic D61-1 Morning Fog. Olympic Paint offers No-VOC paint for improved interior air quality and health. The light blue color is calming and bright -- a much needed feature for this retreat space. The room tends to be fairly dark in the winter so a light, reflective color seems to be the best option for brightening the space. Paired with bright, white trim, the wall color will most definitely add a fresh feeling in the room. B) This darker blue will be pulled in through accessories such as throw pillows on the bed. C) This cream color will come into play on the window treatments and on a large area rug underneath the bed to add a touch of warmth and softness in the space. D) The Wall Color in the Mancave: Olympic C27-6 Burled Redwood. This crimson/terracotta color is a nod to one of my client's alma mater, Virginia Tech (can you tell how committed I am to this?). He joked about using maroon and orange as a color scheme for the whole project but I figured, a maroon-esque color in his dedicated space would be more than enough. The mancave will be fairly small, but with a dark color on the wall, the space will feel intimate and masculine. E) Deep browns will provide a neutral background in the space on the floor and in a leather armchair in the mancave. On the linens, a white duvet with dark brown detailing will set off the soft, feminine florals with masculine lines and just the right amount of contrast. 1) Painted white vintage frames will pull in a bit of feminine charm into the space. It also provides the owners' an opportunity to display black and white family photographs prominently. These will likely be purchased from thrift stores around town and painted. 2) Deep blue throw pillows on the bed will add an additional layer of softness and saturation. 3) This furniture set was selected by the owner and is sold at one of our local furniture stores here in Charlottesville. Made by Whittier Wood, this furniture set has clean lines with Shaker style detailing and oil-rubbed bronze hardware. The lighter oak finish provides a bit of country charm. The set includes nightstands, two dressers, and a bed with drawer storage. 4) This piece - a vanity with large storage towers, is actually made by PBTeen ($499-$1,799). The lady of the house requested plenty of storage and a vanity to hold all of her beauty supplies. I thought the lines of this piece fit nicely with that of the other furniture pieces in the room and loved the amount of storage it offered. Each tower has lots of drawers for organized storage. The pieces can also be purchased together or separately. 5) This oil-rubbed bronze lamp base from Target ($24.99 each) can be paired with any shade and will provide just the right amount of light for late-night reading. It also matches the hardware finishes on the furniture set. Backdropped by the bright, light blue walls, the lamps will beautifully complement the colors in the room. A matching floor lamp will be selected for the mancave. 6) These linens are from Pottery Barn (on sale for $79.99 for a full/queen duvet, $19.99 for each standard sham) with espresso detailing. The masculine lines paired with a beautiful, floral pillow strike just the right balance. 7) This pillow was the color inspiration for the room. The pillow itself is something I found on Etsy, but the fabric is called Richloom Chandler Mod Floral. The soft blues, warm terra cottas, and soft floral pattern are traditional yet elegant providing a beautiful color palette for the space. The use of florals, along with traditionally "country" style furniture, sets the casual tone for the room. 8) This area rug will be placed under the bed, over wide plank, hand scraped hardwood or laminate flooring. The purpose of the area rug is mostly to have something warm to step onto. This particular rug is from Ikea (Egeby Natural - $99.99) and offers a more masculine feeling. To make the room feel more feminine - a softer, floral rug could be used in its place. 9) This chair is the Andrew Recliner by Broyhill and is available through one of our local furniture stores. The perfect option for a mancave - this recliner is sophisticated yet practical. Its dark finish has a strong, masculine feeling and also happens to be easily wipeable in the event of nacho, pizza, or beer spills. Though I'm not always one for rounded arms, I think it's a beautiful chair and a much preferred alternative to your traditional, upholstered pillow-y La-z-boy recliner. 10) In terms of window treatments, my clients requested black-out curtains. These are Eclipse Braxton Window Panels in Khaki from Target ($12.99-$16.99 per panel). They are specially designed to block out light and provide extra heat gain/heat loss protection. The creamy color will add additional softness to the room and the full length panels will emphasize height and verticality in the space. For the mancave, we'll mostly likely use a roman shade with a khaki/maroon stripe pattern. 6) This cream colored bedding (Cameron Matelasse Duvet Cover, 49.00 – $229.00) has more texture and warmth than the previous version, giving a more comfortable feel to the room. 7) This cream and terracotta area rug adds another layer of pattern and texture to the room (buy.com, $229.99). 8) Terracotta blackout drapery panels add richness and color to the space (Target, $57.99). All in all, I think the scheme is much improved.